If your goals don't inspire and motivate you, it's time to rethink how you create them. Do goals inspire, motivate, and energize you? Or do you avoid them at all costs? 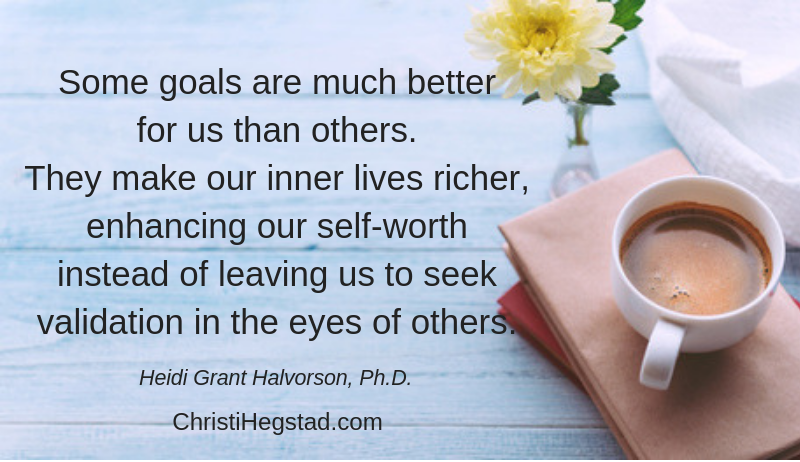 Dr. Heidi Halvorson, one of my favorite researchers in the realm of goals, has studied extensively what makes an excellent goal. And while the traditional components of a SMART goal (a term coined in the early 1980’s which you may have heard of) are important, they do not address some of the most critical components of powerful, purposeful goals. As Halvorson says, those goals that are much better for us “nourish our essential needs as human beings” – regardless of whether they are established for business, athletics, education, family, or beyond. Look at your 2019 goals. Do they inspire, motivate, and energize you? If so, celebrate that! Do you have a clear, concise action plan for achieving them? If so, I bet you’re already off to a great start! If, however, you find them lacking in any way, take the time to revamp them. The time you give at the forefront to make them purposeful and motivating will return to you ten-fold as the year progresses! Want to learn those critical components and how to create a clear, concise, purposeful, and fun action plan for your goals? Attend my Bold Goal training on February 1 – watch your email next week for enrollment details!